If you live in Utah, you have probably heard of the Lion House Restaurant . . . they seriously have some of the best homemade dishes I have ever tried! I got this recipe from my mother-in-law’s friend and it’s pretty dang close to the Lion House’s banana bread recipe, but I love to make muffins with it too. I know that there are a lot of banana bread recipes out there, but this one is my favorite because they always turn out perfectly moist! Sometimes I top it off with a simple almond-flavored glaze- with or without it, it’s still yummy. So, if you have over-ripe bananas, this is a perfect way to use them up! Cream margarine (or butter) and sugar. Add eggs and beat. Add bananas, milk, and lemon juice. Sift dry ingredients and add. Stir in nuts (if using them). Bake in well-greased bread loaf pan for 1 hour at 350 degrees F. Makes 1 loaf. Glaze with mixture of milk and powdered sugar (I don’t ever measure it, I just keep adding one ingredient or the other until I get the consistency I want) and 1/2 tsp almond flavoring. Glaze muffins/bread while still hot. YUM!! Def making this one! mine are in the oven. The recipe yielded 17 muffins, but that is due to me adding a lot of chocolate chips. Recipe would most likely yield 15 muffins. Cant wait to try them! Yes please! I would love some of those right now! We LOVE the Lion House restaurant! These look heavenly ! I will try this out soon ! Are your recipes available to print? Do you have a print button? I am having to copy and paste to a word document. There is a "Print Friendly" button at the bottom of each post. Just click on that and it will be ready to print out! These are wonderful. I have made them several times since discovering the recipe. I add a small amount of chopped walnuts and sprinkle some finer chopped walnut in the top before baking. Once done, i let cool completely before glazing - they look beautiful and taste amazing. The cooking time of 22 mins works perfectly for me. My husband loves these! If you haven't tred - these are a must! We are a senior couple serving in Finland. We are assigned to a small town in the Lapland area for 18 months. We are near the Arctic Circle where we have only 4 hrs of light during most of the winter months. Long nights have encouraged me to try new recipes to share with friends & strangers. This recipe has been a real hit with the Finns. We can't thank you enough for sharing this recipe as it has helped us "find" new people. 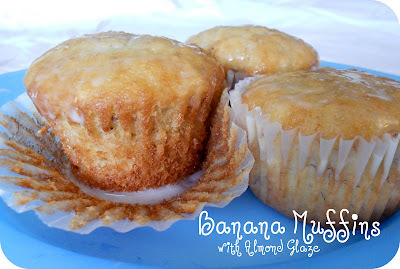 No one turns down a plate of warm banana muffins with an almond glaze! Yum, yum! Do you have to add the Lemon Juice or can you leave it out? Can you make them without the glaze? We have never omitted the lemon juice from this recipe, but I'm sure it will be fine. You do not have to add the glaze on top.